Amazon.com Price: $44.00 $43.91 (as of 24/04/2019 20:42 PST- Details)	& FREE Shipping. The Caravan Sports Infinity Zero Gravity Chair in Biege offers ultimate comfort and portability. This chair is a slimmer version of the oversized chair by the same company. The open dimensions of the chair measure 25.5″ length X 45″ width X 64.5″ height, when folded the chairs measurements are 38.6″ length X 26.4″ width X 6.3″ high. This Zero Gravity Recliner has a new and improved dual finger tip locking system allowing the user to lock the chair in any position once they are seated. The chair also has an adjustable headrest to provide additional comfort or to use as a lumbar support. Made from durable textaline fabric suspended by double bungee system the chair can hold up to 300 lbs. 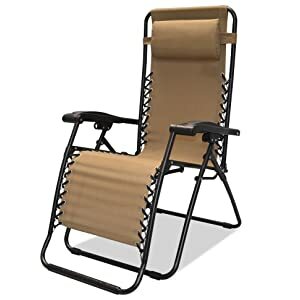 This chair is perfect for the backyard or to take on vacation, weighing only 19 pounds you can fold it up and take it anywhere. This stylish zero gravity chair comes highly recommended by many and you can take a look at all of the buyers reviews in the next tab to find out what others feel about this very popular patio recliner. The oversized version of this model has also accumulated many positive reviews although it doesn’t comes in as many color choices, you can take a look at the Oversized Caravan Canopy chairs here! The Caravan Sports Infinity Zero Gravity Chair offers the ultimate portable comfort. The new and improved locking system allows you to lock the chair in any position and an adjustable headrest is provided for additional comfort or use as lumbar support. Perfect for backyard, beach or sporting event. The Caravan Sports Infinity Zero Gravity Chair Chair elevates the legs and reduces pressure on the back. This position simulates the gravity-free environment astronauts experience in space. The locking mechanism allows for multiple recline positions and a headrest is provided for additional comfort or use as a lumbar support. WARNING: This product can expose you to chemicals including Diethylhexyl Phthalate, which is known to the State of California to cause cancer, birth defects, or other reproductive harm. For more information, go to www.P65Warnings.ca.gov.